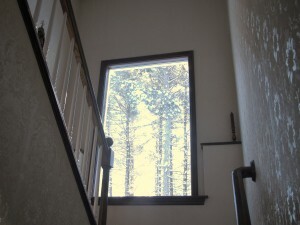 We received feedback on the first showing - “they couldn’t get past the wallpaper” and “Too expensive”. It surprised me that I took it so personally. I guess I’m not as thick skinned as I thought. But I will be! The snowblower is at the shop. It will cost $200 to fix it! At least it hasn’t snowed more than an inch. Hope the snow holds off until it’s fixed. The day they came to get the snow blower, the garage door opener decided to give up the ghost. Another $135 for a new one. Chuck saved an additional $135 by installing it himself with only 2 trips to the hardware store! He also fell off the ladder and wrenched his knee so he’s limping around,but very proud of his installation. He pointed out to me that the opener that broke was the one original to the house and 36 years for a garage door opener is pretty good. They say bad things come in threes but I’m not believing it! 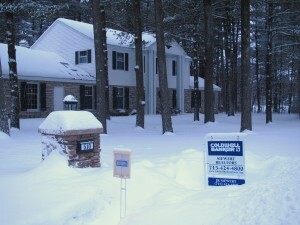 The day after the For Sale sign went up in our yard, the realtor called to schedule our first showing! Boy, were we surprised! So this morning, Sunday, they showed the house while we were at church. I got up early to make sure all the last details were taken care of. When we got home from church, the only signs that someone had been here were the tire tracks in the snow. I suppose we won’t hear anything unless the people were interested. That’s one more step on our journey. The snowblower stopped running on Friday and the repair people can’t take it until Tuesday. It’s supposed to snow Tuesday through Friday so I sure hope they can fix it quickly. We especially wouldn’t want an unplowed driveway for another showing. This morning the door bell rang and there stood a dozen real estate agents queued up behind their fearless leader. 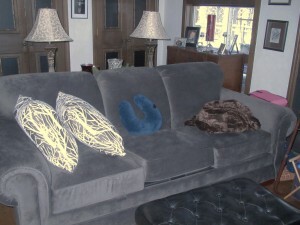 As they streamed into the foyer, they slipped off shoes and put blue surgical booties on their stocking feet. After a short overview by our agent, John, they went off in all directions to study our home. 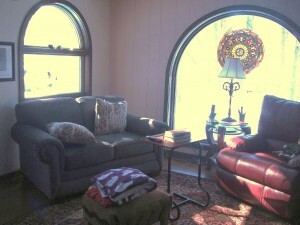 Everyone was very nice and complimented us on the good job we did staging the house. We knew several of the agents, one being our babysitter from years ago. I felt strange having all these strangers taking notes as they surveyed each room. The sunroom and fireplaces seemed to be the favorite rooms. They had toured, put shoes and gloves back on, and gone out the way they came in less than 15 minutes! John promised the sign would go up tomorrow and we gave him a key. On the way out, he asked about the capacity of our septic tanks - after all, these practical things matter. Chuck and I sat down across from each other at the kitchen table and shrugged our shoulders. ”All I have to say is that I sure hope it sells soon,” he said. The next step will be an open house some time in the next month. In the meantime, we can’t make any messes and have to make the bed every morning! Friday was the big day! Our realtor came to take photos for the real estate MLS (Multiple Listing Service) and Coldwell Banker website. We were ready - we thought. He walked through the house to take a look at all of the improvements we’d made in the last 6 weeks. He was very impressed ( almost surprised it seemed). He brought his new camera and a tripod which he set up in each room, one by one. 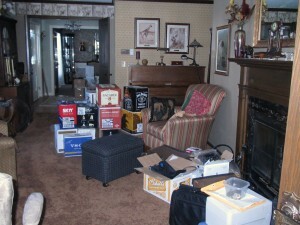 As it turned out, we still hadn’t cleared away enough stuff from counter tops, fireplace hearth, etc. I followed him around with a basket to collect everything he wanted cleared. I think this staging process is the most stressful because we just don’t live in hotel type spartan surroundings. I admit that we desperately needed to clear out a ton of belongings around here. However, it’s not my nature to live in a hotel room. Anyway, he then traveled around the house with camera to make a virtual tour. That will be interesting to look at. 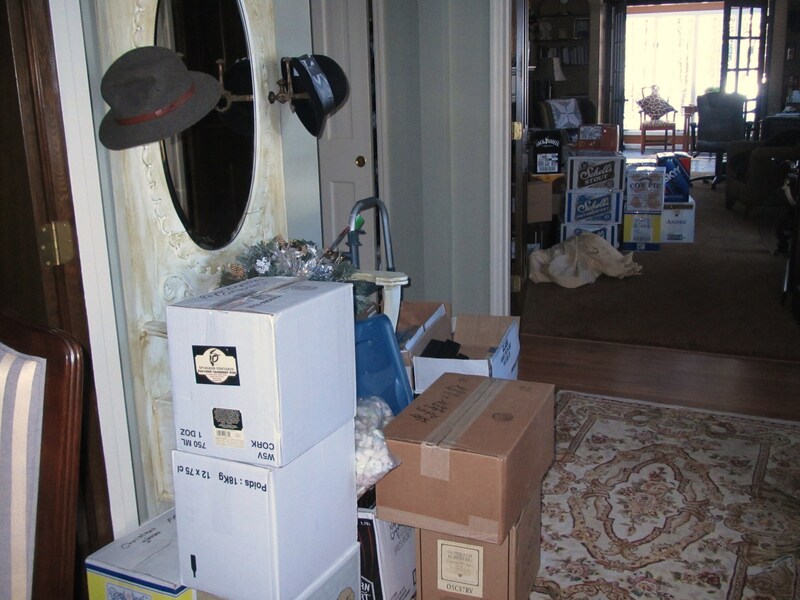 As he was about to leave, I asked, “Where is the for sale sign?” He said it wasn’t ready yet. It seems that a special sign support must be used in the snow. I was disappointed. I wanted to see the sign go up to cap our 6 weeks of work. Oh well. On Wednesday he is bringing his whole sales staff to tour the house so all of them could knowledgably show the house. Maybe he’ll bring the sign then. 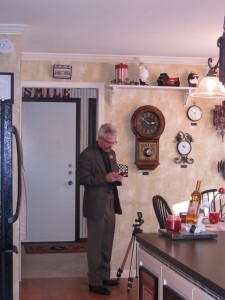 The photo shows our realtor with camera. The following is an excerpt from a book on living with fibromyalgia entitled The Unchosen Path, written by Laurie Hope. I found it to be helpful in my fibromyalgia journey. I hope it helps you too. “Everyone seeks to be happy. But when we physically feel lousy, our external sources for happiness are not so easily accessible. Sometimes the suffering of illness lies not so much in its accompanying physical sensations, but in the personal sense of diminishment and the social isolation and separation it brings. As the body contracts, life contracts as well. Nothing is left unchanged-our relationship to ourselves, our families, and our social world. Because of this, illness causes us to reprioritize our lives, separating the nonessential from the essential. Basic questions of life’s purpose and meaning take on new poignancy as we question the very value of our time here. Illness can be a gentle nudge or a jolting wake-up call that motivates us to reexamine our lives and lifestyles. Because illness exposes our imbalances and weaknesses, it acts as a psychological magnifier that may uncover unacknowledged but deep-rooted feelings that our previously busy lives may have effectively masked. Some of these feelings may appear to be caused by the illness, but really they were there all along. Because they can no longer be denied, they can finally be attended to and healed. Whether we accept the challenge to heal willingly or go down the path kicking and screaming, illness takes us on a descent to our depths. The path to the underworld is opened. It may not be a path we have consciously chosen, but it is the one on which we find ourselves. Here we have the opportunity to mine the gems that can only be found in the deep and dark places. So many spiritual paths have certain austerities or sacrifices that are prescribed. Why do they do this? Maybe to cause us to wrestle with the will of the ego-to develop a spiritual muscle that will be a worthy adversary for the ego’s tenacity. A chronic illness can serve this same function. It motivates us to explore the edge between personal responsibility and God’s will. It demands sacrifice. The ego’s wishes are impersonally ignored by the dysfunctions of the body. Illness insists that we let go of innumerable desires and gives us the opportunity to develop the generosity of heart that can become our salvation. We know by the example of many saints and spiritual masters that they are not immune to the afflictions of the body. But they also show us that there can be joy and divine realization despite the body. Drawing close to God and seeking His truth is cultivated by withdrawing from the distractions of worldly life and retreating. In some ways, an illness provides the perfect opportunity for such spiritual training: removal from ordinary society, solitude, quiet, turning inward, self-examination. If we’re lucky enough to be able to take time off from the demands of the outer world, we can use this time to learn to free ourselves from the personal patterns that contribute to much of our suffering. As our perceptions shift and our worldview opens, how we relate to our bodies and their illnesses also shifts. As we discover that our essential wholeness exists independent of the body and mind, we see that eventually all paths converge. Illness does not necessarily teach us anything. It can be viewed as a mere annoyance or a great tragedy. But it can also be a great teacher and provider of endless opportunities to understand the nature of reality and to develop compassion for ourselves and all others. Through unexpected discoveries I have found that the path of illness, though arduous, can be a rich and honorable one. I used to think that I could enlighten myself out of feeling depressed. If depression is the result of a negative belief system, then it is alterable. But if depression is the by-product of the imbalanced brain chemistry of a disease process, then all my letting go and great perspective and egolessness may not change the tendency toward sadness and negative thinking. Since the enlightened transcendence of depression doesn’t seem to be my present fate, I’ve decided to practice “enlightened depression”-depression coexisting with everything else that is here; depression free from self-blame; depression free from shame; depression that does not separate me from others but rather reminds me of my common humanity. I am not depressed because I hate life-I am depressed because I love life and long for a more energetic involvement with it. This perception takes me to a more fundamental identification-myself as a life-loving creature-connected, involved, part of the unfathomable drama. One day I was asking for guidance about what was needed for my healing and I heard a wise voice saying, “Rest.” Gently, but imperatively. Well, that’s usually the first and most obvious advice that’s given to a sick person, but not exactly what I wanted to hear. I hate resting-it feels like a waste of time. I should be engaging in acts of charity and kindness, be fighting for justice and world peace or be alleviating the suffering of others. Where’s the rest in all that? Then I realized that “rest” didn’t necessarily refer to my worldly activities. What needed rest was my mind. A good, long rest. Rest from the demands of an ego that wants to do and be good. The mind that thinks it has to be doing something is not at rest. And yet the rested mind is effortlessly inspired to right action. It may turn out that resting could be my greatest contribution. I’ve added a second Golden Rule: Thou shalt not compare thyself. Doing so is always deadly. Not only is it disastrous to compare myself to others, but also to compare myself to a memory of my former healthy self or to an image of my idealized future self. When I catch myself comparing, I know it’s because I’m having a hard time accepting things as they are. When I remember that comparison is only a matter of relative perspective that depends on your vantage point, it becomes easier to embrace all the seeming inequities of life. It is in the moment of the full accepting of my brokenness that my essential wholeness becomes apparent, and then it is clear that nothing needs fixing. The wholeness includes the brokenness. Not the thought that “I will be whole someday when I have improved myself or become more loving or gotten healthy.” I am whole now. As I am. Like this. And so are you. Just like you are now. When we can love our own broken or even rotten places, we can love one another as ourselves. I am not a human doing; I am a human being! Realtor told us to paint neutral! 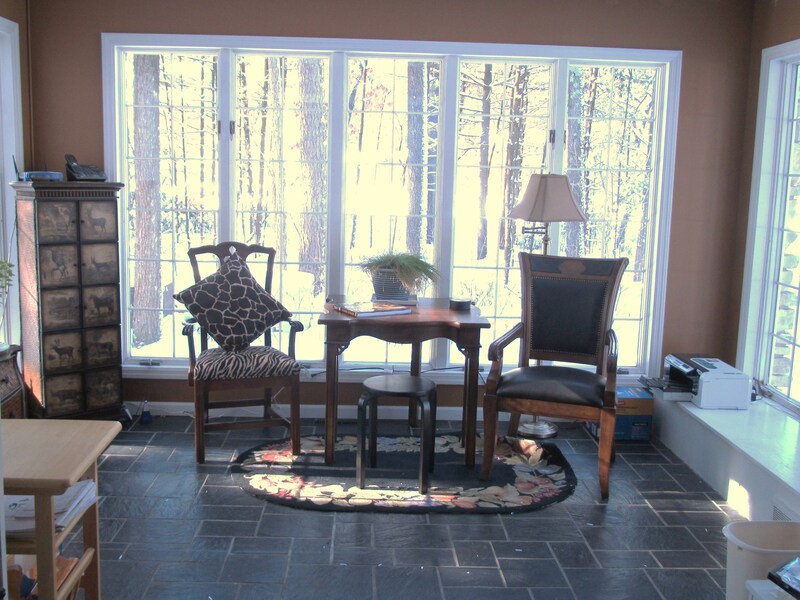 I have been lax about blogging for the past few weeks because of all the work getting our house ready to sell. My parents came out from Pittsburgh to help and have a visit. 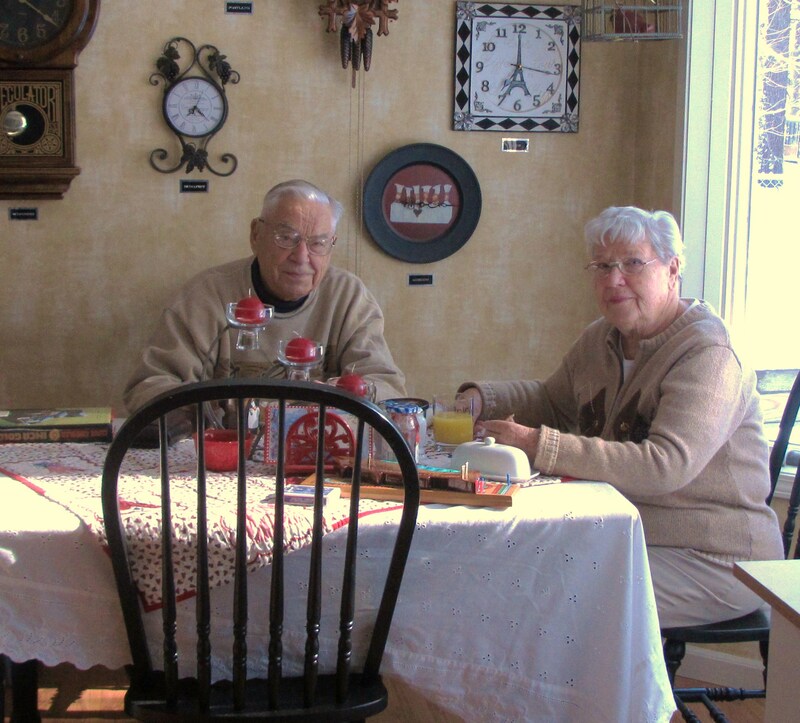 Since they are in their 80’s, we gave them less strenuous tasks. Dad, however, insisted on doing all sorts of strenuous things. 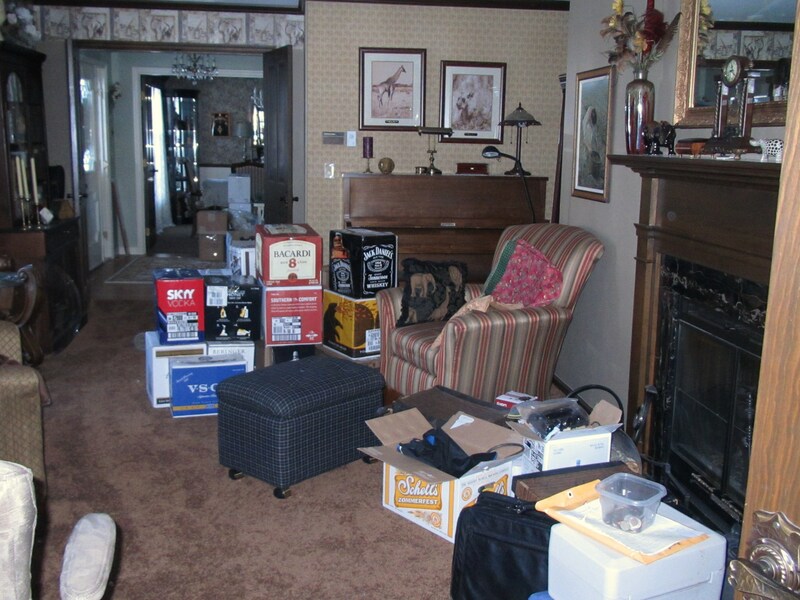 While they were here, we packed everything that the realtor told us needed to be gone in order to stage the house. 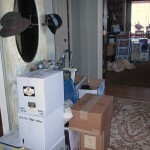 Consequently, there were stacks of boxes in the garage bound for the storage unit. I lost count of how many vanful’s of stuff went to Goodwill! Then there were the various items we sold on Craig’s List. The storage unit we are renting is now full of all the things we want to move to our new house. Mom and I worked for days organizing my sewing room. She thinks I could open a fabric shop! She may be right. I sent 12 large Rubbermaid totes full of fabric to the storage unit and organized everything else in 14 more. It looks so nice in there that I don’t want to mess it up by sewing! Painting became a major project, but first wallpaper had to be stripped. What a ghastly, nasty job! We had pieces of sticky wallpaper all over the place after steaming the paper off. Our baseboards are mostly dark stained wood and were really beat up after 36 years in the house. Dad spruced up all those baseboards. I continued to clean up and organize the basement. The new sofa and loveseat we had ordered for the new house arrived in the middle of all this wrapped in plastic. 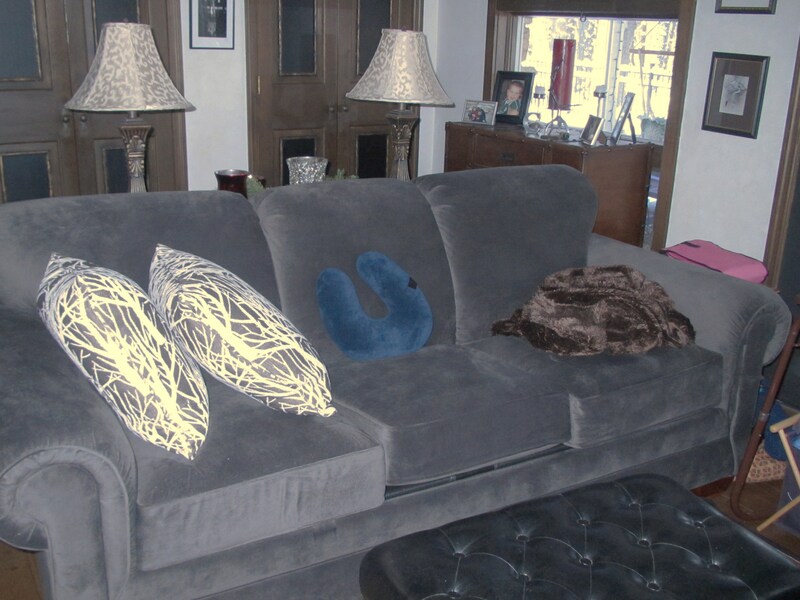 Since we had given our family room furniture to our daughter and son-in-law, we decided to unwrap the plastic and give ourselves something to sit on! The new furniture is beautiful, by the way. Yesterday I organized all my yarn and knitting supplies into giant ziploc bags, leaving out several projects to work on. That just leaves the front coat closet to clean out. I know there is a mammoth video recorder from the 1980’s in there! So today the painter is finishing touchup painting all over the house and refinishing some doors. He painted 3 rooms this week as well. The carpet cleaners just finished so there’s furniture piled all over the place. My husband and I have been cleaning the crystal chandeliers. We’ve taken the smaller ones apart to wash but the 2 big ones are a different story. I learned how to do it from an innkeeper where we stayed last summer. I’d commented on how sparkly her big chandelier was. She told me that to clean it you place a sheet of plastic and old towels on the table under the chandelier, turn off the lights, and fill a spray bottle with a mixture of warm water and isopropyl alcohol. Then spray the whole chandelier. When it is done dripping, it will dry sparkling clean! 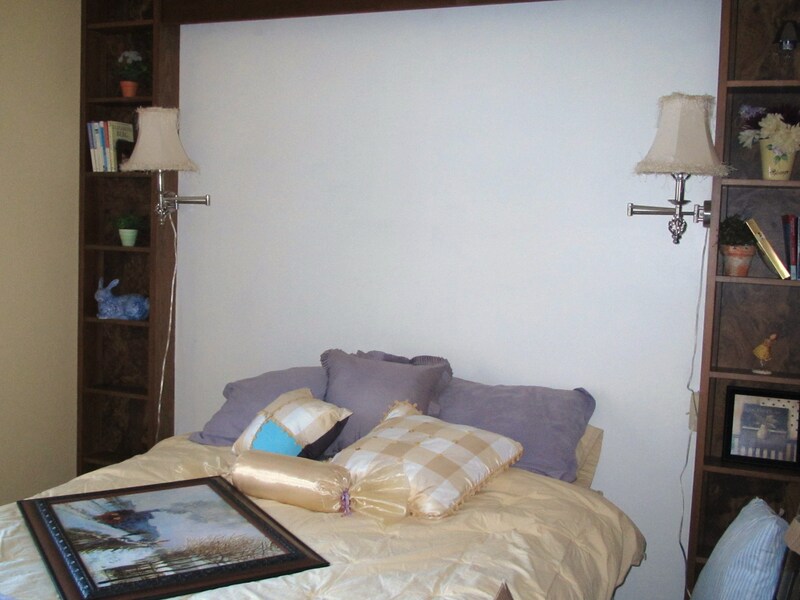 Tomorrow we’ll place the furniture back in the rooms, set out the accessories, vacuum and put away all the paint brushes, tools, etc. Friday the realtor comes to take photos of the interior to put on their website. Before he leaves, he’ll put the sign in the yard. It still hasn’t hit me emotionally that after 36 years, we will be leaving our home, the home where we raised our five kids. Maybe when it stands empty and the moving van is pulling away, I’ll let myself cry. 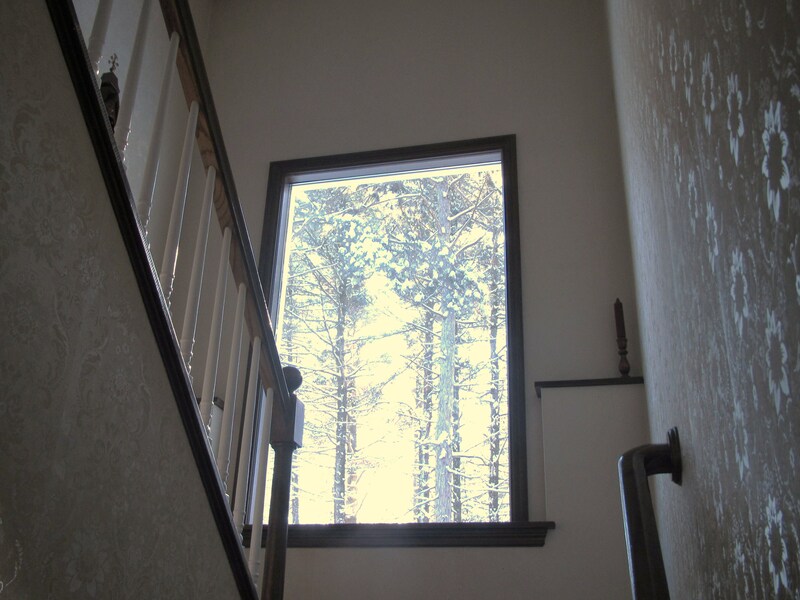 The big stained glass window with our initial in the center that we had an artist make when we built the house has been removed, replaced with a clear window, and crated. It’s a part of our home we are taking with us to the next one. I really hope the house sells soon though, so we can get on with our plans to build our retirement home in Door County, Wisconsin. I’ll keep you posted.